Photo by True Photography Weddings - A sweet and joyful memory, this bride exudes an obvious joie de vivre in this playful lounge pose. With an opportunity like this, what bride wouldn’t want to kick up her feet and celebrate! These elegantly seated brides invite us to view a moment of captured thoughtfulness, seduction, poise, and playfulness. The three elements that create this iconic photograph are the solo bride, the unique choice of chair, and the way in which the bride is sitting. With a simple mix of the trio of components, an entirely new environment is created. 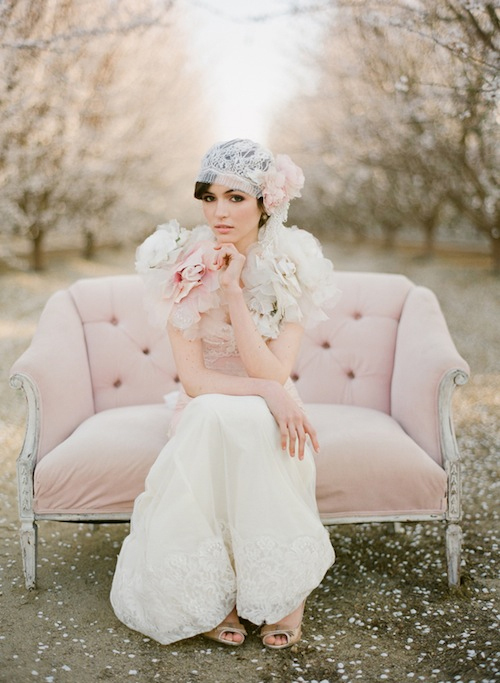 We have found the following collection of brides to have mastered the pose of Sitting Pretty. 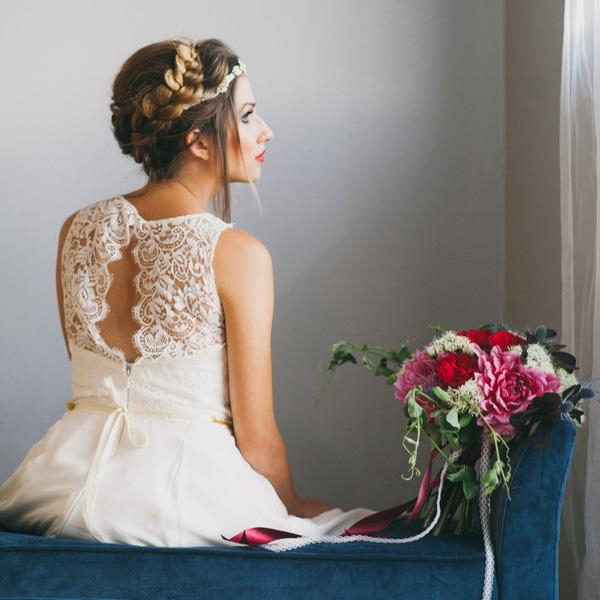 Though this bride is seated in a shabby chic room with chipping paint and wild vines, the topsy-turvy blue chair draws your eyes immediately to the stunning lace and silk of her gown. The vines are bursting with soft blooms and hints at a jaunt through WonderlanPerhaps she’s looking for the White Rabbit? 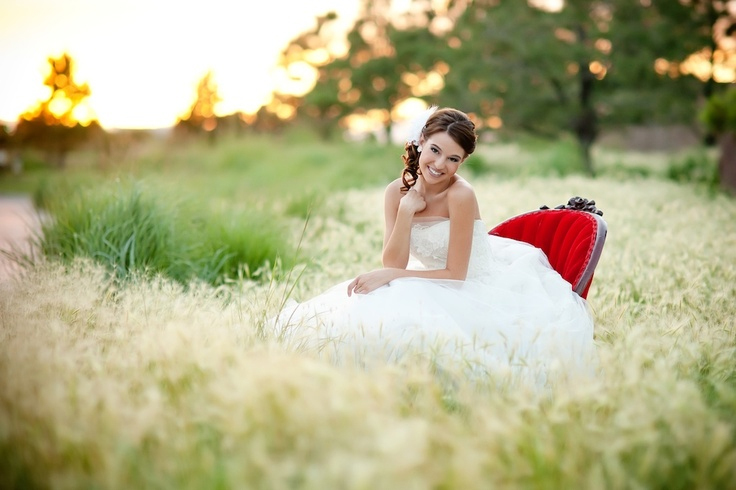 Photo by Archetype Studio Inc.
A fun and flirty alternative chair pose, this vintage bride takes advantage of a backwards-facing chair with a peekaboo pose, swinging her legs over the armrest, placing her chin on her hand and slyly making eyes past the photographer. An early 20th century love-seat, a coy pose, and a 1920s-inspired lace veil headdress has us dreaming of a wedding influenced by the Jazz Age, complete with flowing fringe accents and guests dancing the Charleston. The blue velvet bench and rich red and pink bouquet draw just enough attention away from the backward-facing bride so that you feel you’ve captured a private thought. 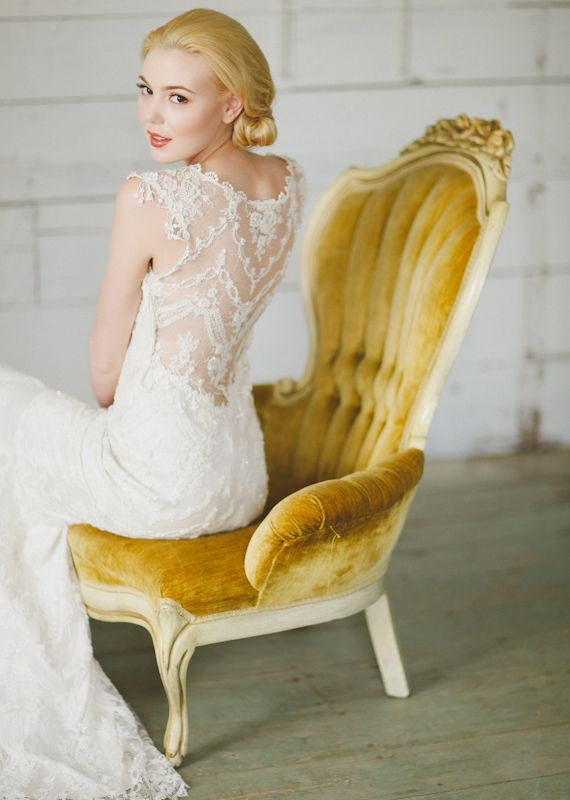 This pose is a brilliant way to show off a wedding gown’s decorative back. The combination of dusty pink and dark grey has always been a chic favorite, but pairing this beautiful bride’s silk and lace dress with a pink French Louis XVI style canapé is simply stunning. She almost seems to be caught off-guard by her slightly slouching pose, but her gaze is powerfully on point. Taking advantage of an empty corner adds the contrast one needs to capture this classic photograph. From the red tufted love-seat placed away from the wall, to the white tulle of the bride’s dress, and from the pale mint-green molding of the great wall, to the polished wood floors, each contrasting color and pattern plays an integral role in highlighting her beauty. Not every bride is the spitting image of Grace Kelly, but any bride can emulate that poise and sophistication with this pose. A subtle adjustment of a signature seat, a long, elegant back, and a glance over the shoulder creates the balance of romance and refinement. 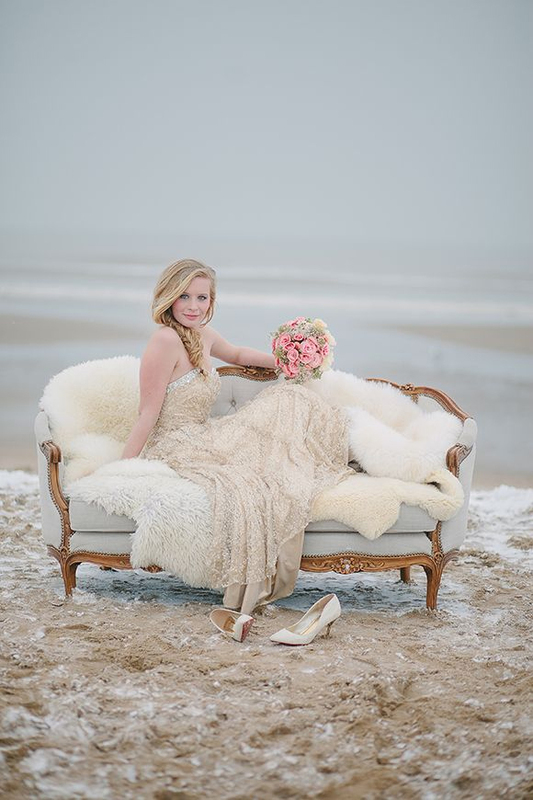 With a handcrafted love-seat and layers of luxurious cream and beige-colored fur, silk, and lace fabrics, this beautiful bride brings warmth into a cool shoreside photo. This image may look familiar to you. The wide expanse of mussed tulle fabric, the bride casually leaning forward, and the white and teal color pairing are all reminiscent of a classic Marilyn Monroe “ballerina” photo shoot, shot by Milton Greene in the 1950s. This look is classic and casual, but stunning. 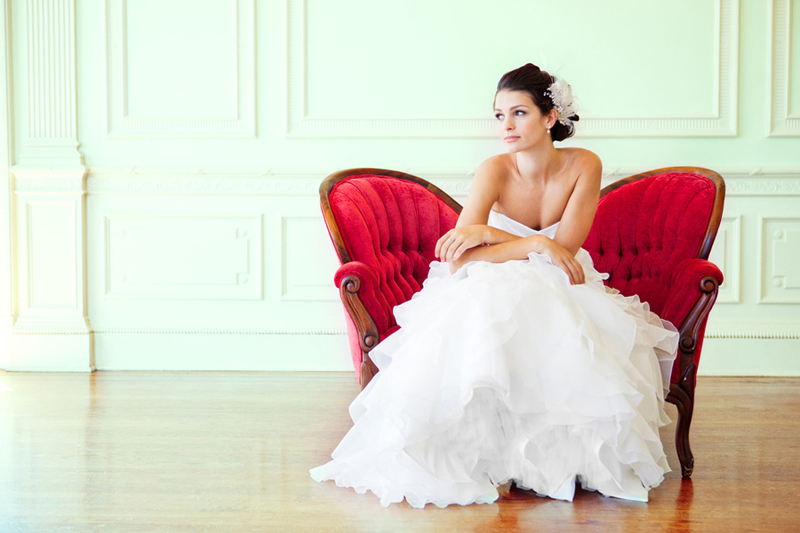 A sweet and joyful memory, this bride exudes an obvious joie de vivre in this playful lounge pose. With an opportunity like this, what bride wouldn’t want to kick up her feet and celebrate! 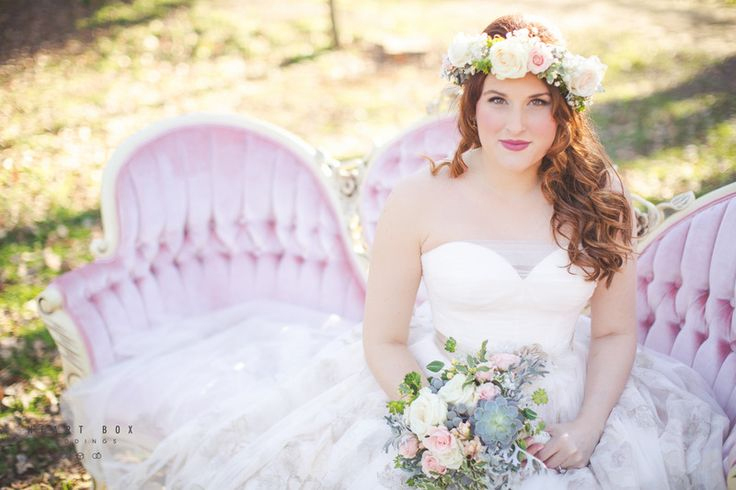 With a gorgeously tufted french love-seat as her main backdrop, her cocktail-style dress, and her sophisticated floral accents, this bride combines the best of the Victorian Era, the 1950s, and the modern bohemian movement with beauty and grace. Look at the field as rippling waves of grass and greenery for a moment. There in the middle is our beautiful pearl of a bride, seated casually in her ruby red oyster shell style settee, the focal point of the photograph with color, focus, and pose. The sitting pretty pose isn’t just for stealing a moment with a bride to capture her excitement alone – it’s also about showing off! We adore this bride (and photographer) for finding the beautiful hand carved, giltwood table and chair that perfectly compliment the ornate embroidery and turquoise color of her gorgeous gown. Wow! Channeling her inner flower child, this bride’s effortlessly stunning pose in the center of a dirt road seems to say, “going my way?” Her wild locks, oversized floral headdress, and natural-colored cloth dress add a sense of whimsical 1960s wonder. 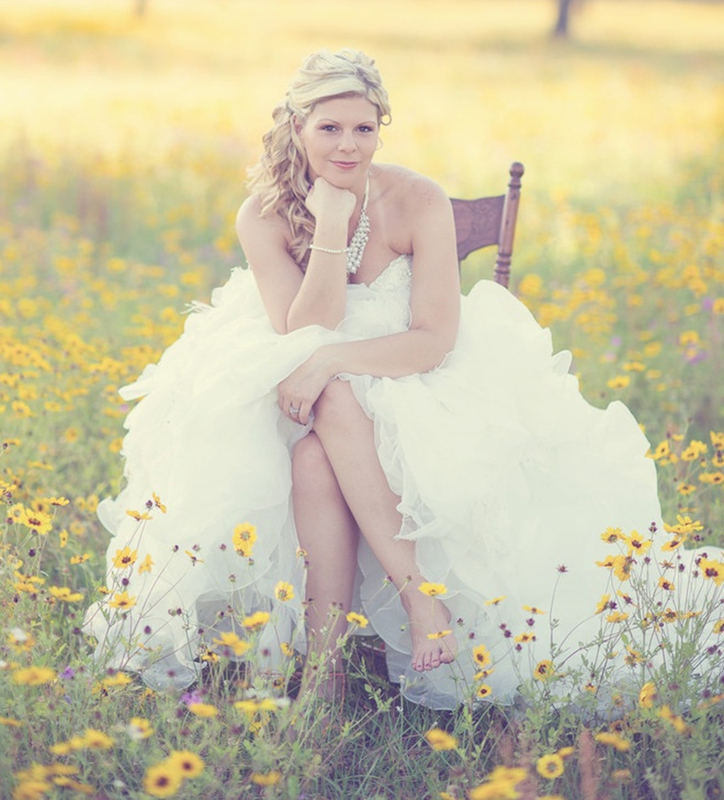 No need for plush, tufted velvet, this relaxed bride takes her seat to a field of wild yellow daisies creating the perfect chic country portrait. One of the ways this pose works is by removing the bride from the excitement and allowing her to breathe. This thoughtful bride, who is (seemingly) candidly resting shoeless and curled up in her dress on a soft sofa overlooking the land is just divine. This contemporary version of a 19th century wingback chair creates an organically flowing form, ideal for this bride’s pose and environment. 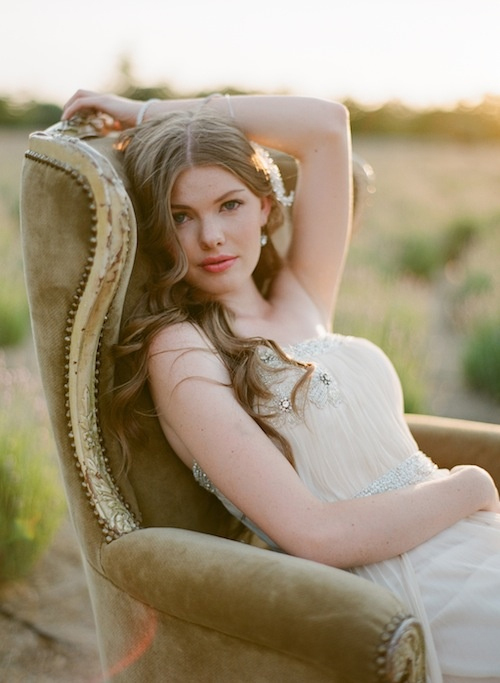 The soft velvet of the seat compliments the soft lighting of the sunset, while the colors match the tones of the field during her elegant sit. 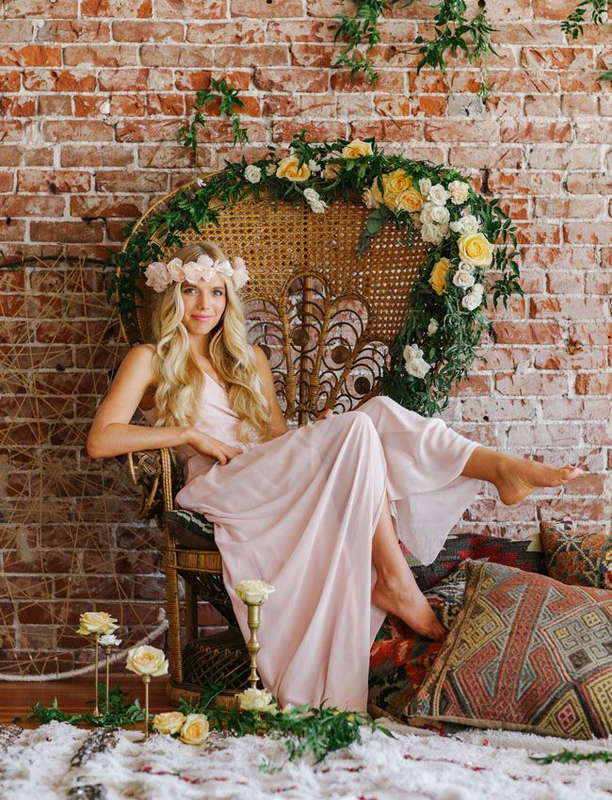 A bohemian bride in a hand-carved Victorian love-seat may look unusual, but place the barefoot beauty in a rattan peacock chair dripping with greenery and blossoming white and yellow blooms and her playfulness is captured!